First off…I hate the Lakers. Secondly, I love the Rockets. Thirdly, “hack-a-Dwight” is a stupid name and they need do change it. “Hack-a-Howard” is better, but still not as good as “hack-Asik”, which really recalls the original “hack-a-Shaq”. With that all acknowledged and in the open, we can proceed. Last night, the LA Lakers pulled off something of an upset win at the Toyota Center thanks to a last second Steve Blake three. Father time has not been kind to Steve Blake who sort of resembles a skeleton these days, but his 4/6 from the arc was crucial for the Lakers who came out with all guns blazing (36-19 in the first) only to be pegged back by the Rockets in the third, before a late burst brought them their third win of the season. A huge part of their win was their fourth quarter move to start deliberately fouling Dwight Howard. Watch the highlights on ESPN, it’s ridiculous. On one play, the ball was rebounded, Dwight ran down the floor, body swerved a Steve Blake foul, made it over half court as the Lakers swarmed him and was eventually fouled. The Lakers practically abandoned what one might call “traditional” defense – i.e. defending the basket, so that they could foul Howard. The total foul count (Lakers 36-17 Rockets) and the total free throw count (Lakers 15-52 Rockets) told the story. Or rather it told part of the story. The other part of the story is to be found in the FTM-A column of the box score. Dwight Howard, C, 5-16. James Harden, SG, 14-16. Harden is the guy with the ball in his hands at the end of games. He is also the most fouled player in the league, thanks in part to his herky-jerky style of attacking the basket that draws fouls (okay, acknowledging the occasional flop) like nobody else. The Laker bench outscored the Rockets 54-23, but the Rockets only played three guys off the bench. The Lakers bench included gunner Jodie Meeks who went 5-7 from three, and the forgotten man of the 2010 draft (he was taken fourth), Wesley Johnson, who had 16. Here’s my problem with the whole thing. The NBA has this frustrating “defensive three seconds” rule, where players have to be within arms reach of the guy they are defending if they want to stand in the key. This was introduced in order to open up the key for the spectacular dunks that are the selling point of the entire league (let’s be honest here, other than the occasional ankle-breaking-crossover-into-step-back-three, the highlights are dunks or spectacular round-the-rim finishes and little else). It also severely inhibits the zone defence that some teams try to play, which requires serious movement on the part of any man based in the middle of the zone, effectively nullifying the strategy. The league also introduced the “no hand checking” rule for the same purpose – it was an effective way of slowing down opponents. So why, oh why, oh why, oh why, do they continue to allow these deliberate off-the-ball fouls to continue? The average NBA game lasts about 2 hours and 10 minutes. With 48 minutes of game time and 12 minutes of half-time, that’s quite a lot of real time where nothing is happening. Are you seriously telling me that watching a clumsy, but spectacularly athletic big man clanking free throws makes for an exciting game? There is also the question of deliberate fouls and how these fit into the rules of basketball. Surely a foul committed in the act of attempting to defend an opponent is not the same as running up to a guy and tapping him in the arm so that you can stop the clock and, once a team reaches the foul bonus, have him shoot free throws. How is this not unsportsmanlike conduct? Clock stopping fouls are a hallmark of the game internationally, but these involve fouling the ball handler. It’s of course all relative, but it seems to me that you can attack the ball handler in such a way to attempt to steal the ball and, if you fail, perhaps commit a clock-stopping foul – but that is at least an attempt to make a play on the ball. Chasing a guy, who is nowhere near the ball, and tapping or swiping at him in front of the referee so that the referee calls a foul – and just a “regular” foul, not even a technical or unsportsmanlike foul – so that the player has to shoot free throws, is not the same thing. 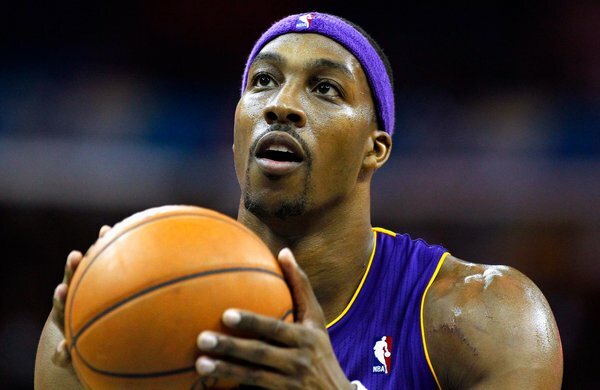 Of course Dwight Howard could solve all of this by simply hitting his free throws, OF COURSE HE COULD. I get it. I’ve said, on these pages before, that he needs to be a lot better with free throws if he really wants to be an elite player, or if he wants his team to be a legitimate contender. This deliberate hacking has gone too far. It’s frankly cowardly and its ruining the game. It’s time to make punish the teams that foul deliberately by giving the ball back to the opponent after free throws. Muchas gracias por esta información, la verdad que es bueno conseguir cosas asi, ahora mismo iniciaré un trabajo del cual este tema me va como anillo al dedo.